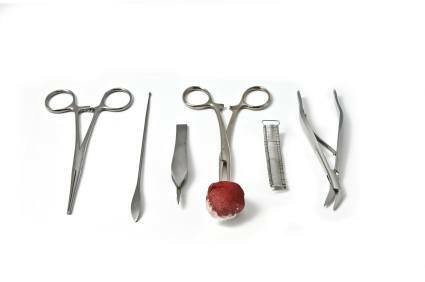 Incidents involved foreign objects left inside the body during surgery are common occurrence. Statistics from The New England Journal Of Medicine show that most large hospitals will have at least one incident per year where a surgical teams leaves surgical equipment behind. The most common item left inside body cavities are surgical sponges. Even larger items have been left inside the body cavity including: scalpels, scissors, tweezers, needles and even parts to a drill. Surgeries that require opening of the chest or abdomen have a higher likelihood for the hospital staff leaving foreign objects behind. There are similar increases in the number of incidents in emergency surgeries, unplanned changes during surgery and in people with higher body mass indexes. Foreign objects left in the body may remain relatively quiet for years before they are discovered. Once discovered these foreign objects usually need to be removed. Foreign objects may become dislodged and cause major injuries such as sepsis, infection, internal bleeding and death. Why Are Foreign Objects Left During Surgery On The ‘Never List’?